Hong Kong Golf Club (HKGC) will welcome back four-time champion Miguel Ángel Jiménez to this week’s Honma Hong Kong Open presented by Amundi. The flamboyant Spaniard will be among the main drawcards at the 60th edition of the tournament over the Composite Course at HKGC, a Golf Course Facility Member of the Asian Golf Industry Federation. 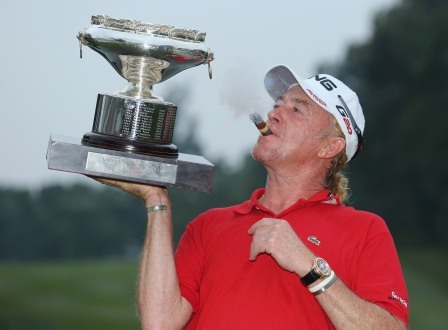 Miguel Ángel Jiménez celebrates his 2012 success at the Hong Kong Golf Club. As a four-time Hong Kong Open winner, Jiménez shares the distinction of being the tournament’s most prolific champion with Taiwanese Hsieh Yung-yo. While victory in 2005, 2008 and 2012 ensured his name will forever be associated with one of Asia’s most prestigious titles, it was his thrilling play-off triumph in 2014 that saw him extend his own record as the European Tour’s oldest winner, before adding a 21st title on home soil at the Open de España later that year. In 2017, Jiménez proved that he still has what it takes to compete at the highest level, shooting a final round of 63 at Hong Kong Golf Club to match the tournament record and reaffirm his belief that a fifth title is still there for the taking. Joining Jiménez in Hong Kong will be another charismatic player in Eddie Pepperell from England. Pepperell claimed his maiden European Tour title in Qatar by a single stroke over Oliver Fisher at the start of the year. The win came in his 129th start on Tour. In the summer, he was runner-up in the Aberdeen Standard Investments Scottish Open, a result which earned him a place in the 2018 Open Championship the following week, where he tied for sixth after a final round 67, the best of the day. Last month, Pepperell held off the challenge of Alexander Björk to win his second European Tour title of the season at the Sky Sports British Masters. With the victory, Pepperell moved to a career best 33rd in the Official World Golf Ranking. The duo will line up against another stellar field in Hong Kong, including Masters champion Patrick Reed, Ryder Cup stars Tommy Fleetwood and Sergio Garcia, and fellow European Tour winners Matthew Fitzpatrick, Rafa Cabrera Bello and Andrew ‘Beef’ Johnston. Leading the charge from the Asian Tour is Indian Shubhankar Sharma who leads the Habitat for Humanity standings over second-placed Park Sang-hyun of Korea. The US$2 million event is sanctioned by the European and Asian Tours as well as the Hong Kong Golf Association.